I want project committers to use Gerrit code review exclusively for my project. Everything must be reviewed -- no direct access to the main repo should be available. 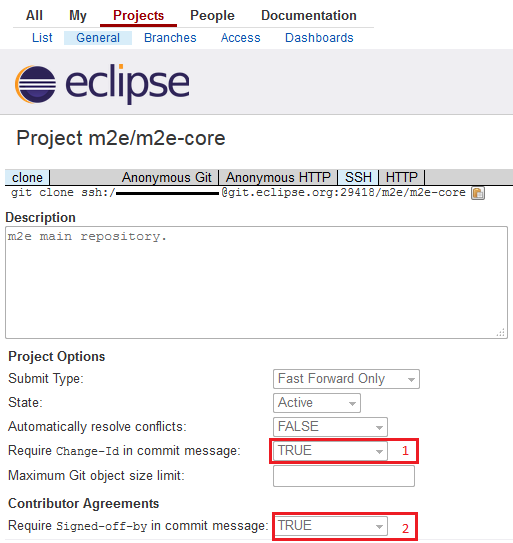 In order to contribute you need an Eclipse user account and to sign the Eclipse Contributor Agreement (ECA). Be sure to use the same email address when you register for the account that you intend to use on Git commit records. Logon to the Gerrit Web UI (see links below) using the email address you registered with your Eclipse Foundation account and password. When accessing Gerrit over SSH from git or EGit use the username displayed in your user settings (e.g eclipse.org Gerrit) and upload your public SSH key to Gerrit. When accessing Gerrit over HTTPS from git or EGit, use the username and password displayed on this page. By default the password field is blank. You must create a password using the "Generate Password" button. This page was last modified 08:36, 25 June 2018 by Wayne Beaton. Based on work by Mikael Barbero, Elliotte Rusty Harold and Markus Keller and others.